Tonight I had another great opportunity to take my photography to new heights...literally. 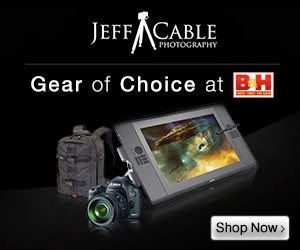 I was shooting another ad for the Lexar "Focused on Photographers" campaign. 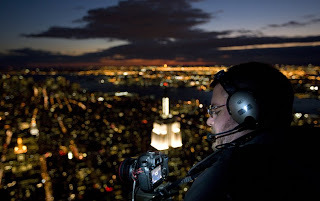 This time I was harnessed to a helicopter (with the doors removed) and shooting the Pulitzer Prize winning photographer Vincent LaForet while he was shooting photos of New York City. We hovered at 1300 feet over the Empire State Building at sunset and also flew over to the Statue of Liberty to shoot there as well. It was cold and windy, but very fun! 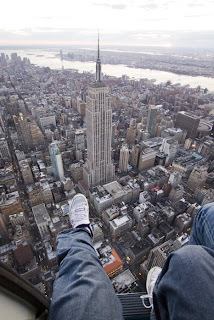 I actually prefer flying over New York as opposed to driving through it. The sites are better and there aren't any people in your way. 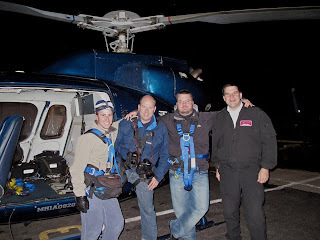 Taken after we landed, this is the assistant, myself, Vincent LaForet and the pilot.